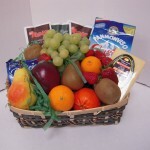 At Quattrocchi's Specialty Foods, we offer a large selection of gift baskets designed to accommodate everyone's tastes and budget. We carry a delicious variety of seasonal and tropical fruits, imported and domestic chocolate, locally produced cheddars, nuts, cookies, candy, imported cheeses and gourmet items. 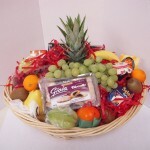 We also carry sugar-free chocolate and cookies for needs of our diabetic customers. 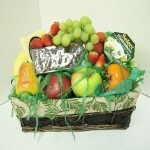 Our baskets are designed and tailored to fit the individual preference of the recipient. 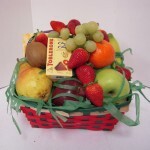 Whether its to say I Love You, Get Well Soon, Thank You, Happy Birthday, to offer your condolences, or just to brighten someone's day, you can be sure a Gift Basket from Quattrocchi's will be enjoyed and remembered. 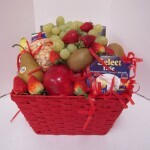 We offer a wide variety of products that are sure to make your basket "just right", and starting at only $20, there is a basket to fit everyone's budget. Delivery is available for Kingston, Ontario, CANADA and the surrounding area. Please note that fruit selection may vary due to seasonal availability. 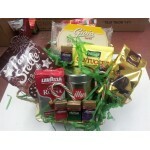 Choose a gift basket from our selection below.